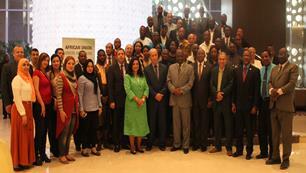 Cairo, Egypt, 18 April 2018,–The Economic, Social and Cultural Council (ECOSOCC), the advisory organ of the African Union, held Joint Planning Meeting for six of its Sectorial Clusters from 16–18 April 2018. The purpose of the meeting was to create a platform for proper planning, provide technical input into the policy and programmes of the African Union Commission and finally to work in synergy with the various AUC Departments. The meeting provided participants from ECOSOCC Sectorial Clusters with information on the African Union Commission’s relevant technical departments and their annual work plan for 2018/19 in relation to Agenda 2063 to share with their counterpart technical cluster committees. This was done to create a conducive environment for a joint planning session that enables ECOSOCC to make meaningful contribution into the work of the African Union Commission with technical input to the various departments. In his opening remarks, Mr. Ahmed El Basheer, Director of the Citizens and Diaspora Directorate (CIDO) acknowledged the significant progress made since the elections of ECOSOCC’s current Standing Committee which has changed the narrative of the Organ to be an Organ that adds substantive value to the programmes and policies of the African Union Commission. He also commended the engagement of all Cluster Chairs and members of various Clusters including the wider civil society organisations for their support to the AUC programmes. image006.jpg“The ECOSOCC Secretariat has established a harmonious relationship with the Commission’s various technical departmental heads and their counterpart sectorial cluster chairs of the ECOSOCC up to the level of the African Union’s Commissioners and the Chairperson. It is now the responsibility of each and every ECOSOCC Cluster Chair to keep that engagement alive”, he added. In his remarks, Head of the African Union’s Permanent Observer Mission to the League of Arab States, Ambassador Abdel Hamid Bouzaher reminded the participants that one of their roles as Civil Society on the continent is to work hand in hand with the African Union Commission assisting in the promotion of the Commission’s programmes and policies. He also shed light on the African Union’s flagship projects under the Agenda 2063 and its respective 10-year implementation plan. The participants of the Joint Planning Meeting reviewed the status of the implementation of ECOSOCC sectorial clusters’ operationalization Action Plan, and discussed presentations of ECOSOCC Strategic Plan and the Agenda 2063 for strategic alignment with their respective cluster plans for 2018/19. Finally, the meeting was a platform to explore in concrete terms how to better integrate ECOSOCC inputs into the policies and programmes of the African Union Commission.